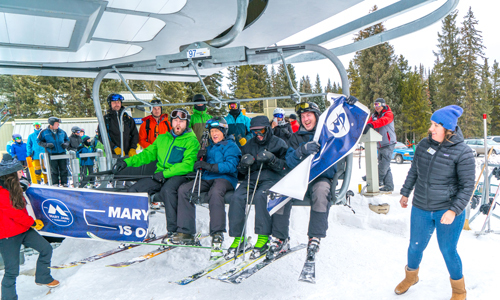 Thanks to the hard work of slope maintenance and ski patrol personnel, Winter Park Resort’s favorite lady finally made her long-awaited 2017-18 debut as the iconic Mary Jane Territory opened last week featuring the Super Gauge Express and Galloping Goose lifts with service to the Mary Jane Trail and Shoo Fly. A lively crowd lined up early to be the first this season to ride Winter Park Resort’s iconic Mary Jane Territory. The celebration will continue all weekend as with more terrain scheduled to open throughout next week. Winter Park’s newest trail, Sober Englishman, will also be open, providing easy access from the Zephyr Express Lift to the Mary Jane Trail. First chair at the Super Gauge will be 8:30 a.m. through the hollidays. Check the Winterparkresort.com site for other openings and closures. All restaurants at the Mary Jane Base, including Club Car, the Mary Jane Market Café, and Pepperoni’s will also be open for the season.